Gabriel is an internationally known, award winning hornmeister (www.GabrielJazz.com) with nine Billboard hits. 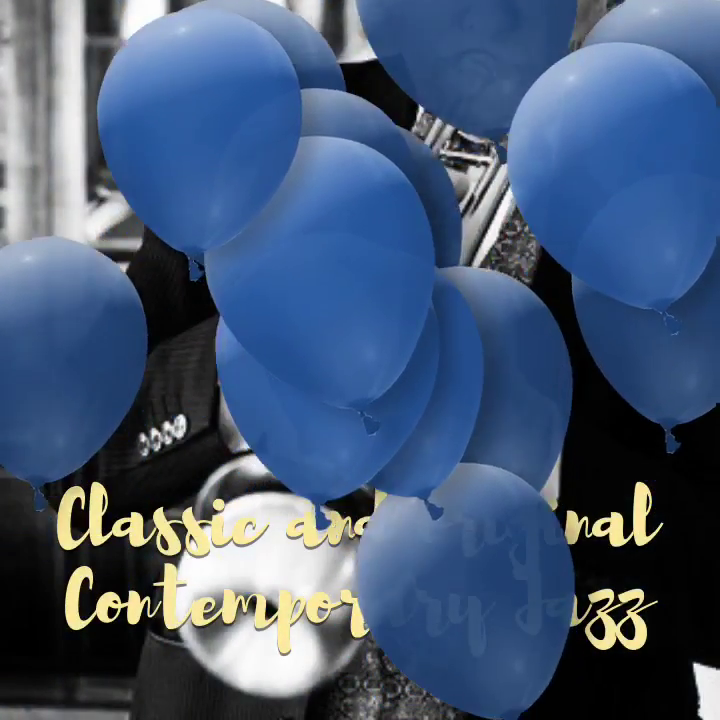 Besides playing festivals all around the world, he was in NOLA during the 2018 Jazz Fest for a series of CD release shows for his new MidCentury Modern Vol 1 album. He performed at The New Orleans Jazz Museum, The Mahogany Jazz Hall, Snug Harbor (with the Uptown Jazz Orchestra), The Spotted Cat, and Fritzels, and guested at Kermit Ruffins' Mother-In-Law Lounge. Gabriel on trumpet, flute, and flugelhorn. 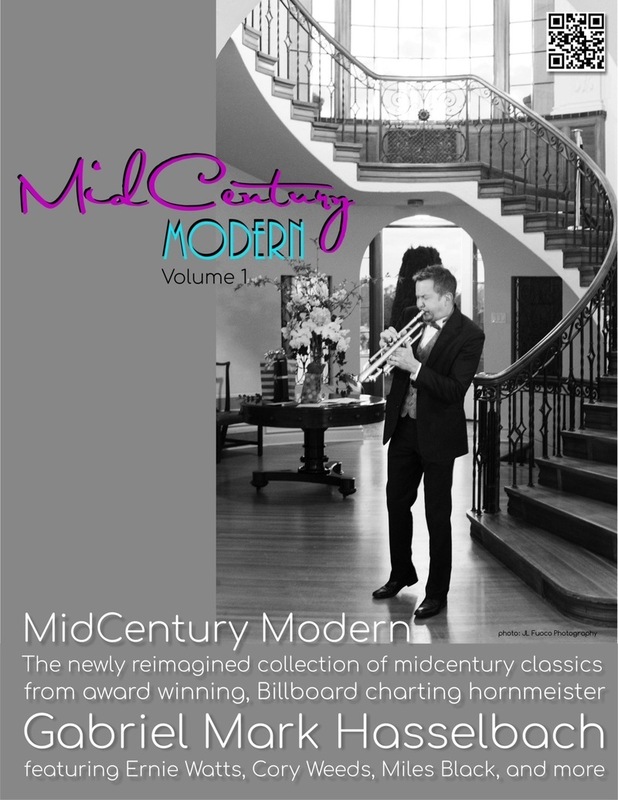 Award-winning hornmeister Gabriel Mark Hasselbach aims for a jazz trifecta with his new album MidCentury Modern Vol. 1, a decidedly mainstream jazz juggernaut. Gabriel is a bit of an enigma, in that his lexicon is not limited to one style of jazz, nor one instrument. 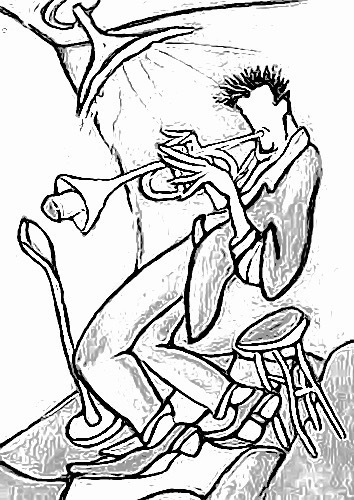 He plays trumpet, flute, flugelhorn, valve 'bone, and more. 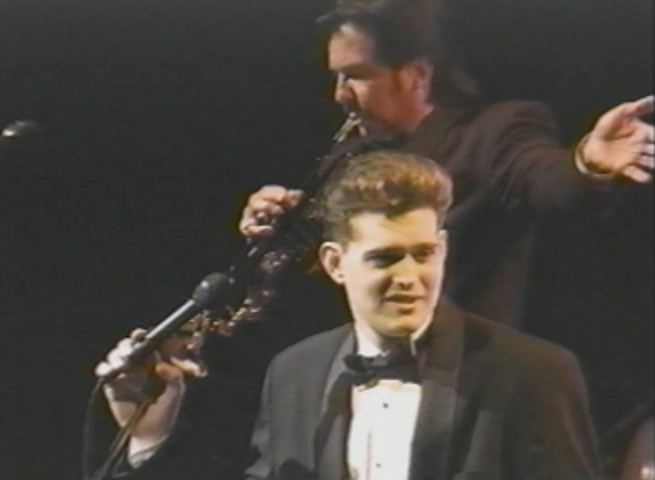 If you are a mainstream jazz lover, you would know Gabriel from his two mainstream JazzWeek charting albums, including Come Out Swingin', which included the debut of a young Michael Bublé, actually singing great jazz before his rise. 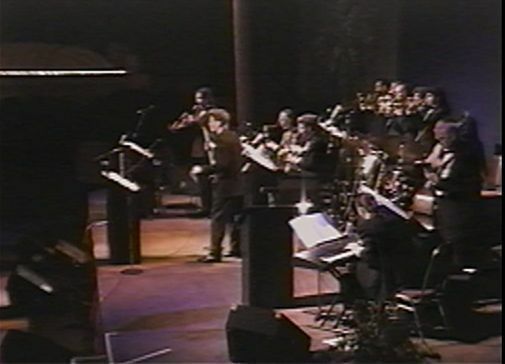 Contemporary Jazz lovers will have heard many of his ubiquitous nine Billboard hits from a dozen albums, and know of his Album of the Year and Instrumentalist of the Year awards. To drive that mainstream message home, here he has enlisted iconic colleagues such as Ernie Watts, Cory Weeds, Miles Black, and Canada's answer to Gregory Porter, Mike Taylor, to craft a highly listenable project, that incorporates hard-swinging mainstream jazz sensibilities, a little succinct contemporary jazz clarity, and some rollicking New Orleans jazz panache. Trifecta accomplished! Gabriel debuted this album in New Orleans during the New Orleans Jazz Fest, at the New Orleans Jazz Museum. He continued his tour in Canada and the US for other dates. The lead-off track Mississippi Jump, a remake of a Blue Mitchell classic, jumps hard like a 'sidewinder' but has also been remixed for Contemporary radio and is included as a bonus track. As the Jazz Crusaders once said, "Put it where you want it"! Gabriel has performed at Montreux, North Sea, JVC, Chandler, and other festivals. He has performed in Japan and in Singapore (for the President! ), and even in the home of Bill Gates. He has worked with artists such as Larry Coryell, George Benson, Chuck Loeb, Bob James, Brian Bromberg, Jeff Lorber, Warren Hill, Bob Baldwin, Cal Harris, and Paul Brown to name a few. Gabriel has the chops for authentic mainstream fare, but also loves a funky groove (60's soul jazz influences), and incorporates them effortlessly into a punchy and seamless stage show, brimming with lyricism, color, and texture. His influences range from underserved classic artists like Blue Mitchell, Donald Byrd, Joe Gordon, to icons such as Clifford Brown, Freddie Hubbard, and Chet Baker. I just had a chance to listen to Gabriel Mark Hasselbach’s album “MidCentury Modern Vol. 1” and was astonished by all the great playing and great production values. Whether playing on a swing or funk tune, his great tone and impeccable phrasing comes through every time, like liquid gold. My favourite tracks are Mississippi Jump, Terra Firma where he and Ernie Watts swing their buns off and UberSmooth where Gabriel shows off his ability to make hearts melt. Gabriel Mark Hasselbach has outdone himself on this album. Once again, Gabriel Mark Hasselbach has produced an album of fine jazz, combining the Straight-ahead style with modern jazz and what he refers to as MidCentury music, all woven together like the lovely, colorful threads of a Canadian poncho. You can wrap yourself up in his music and feel warm and satisfied. There is a beautiful vocal on “Nature Boy” sung by Mike Taylor. His voice is smooth and sweet as warmed caramel candy. It was a nice surprise to hear a vocal on Hasselbach’s normally all instrumental project. 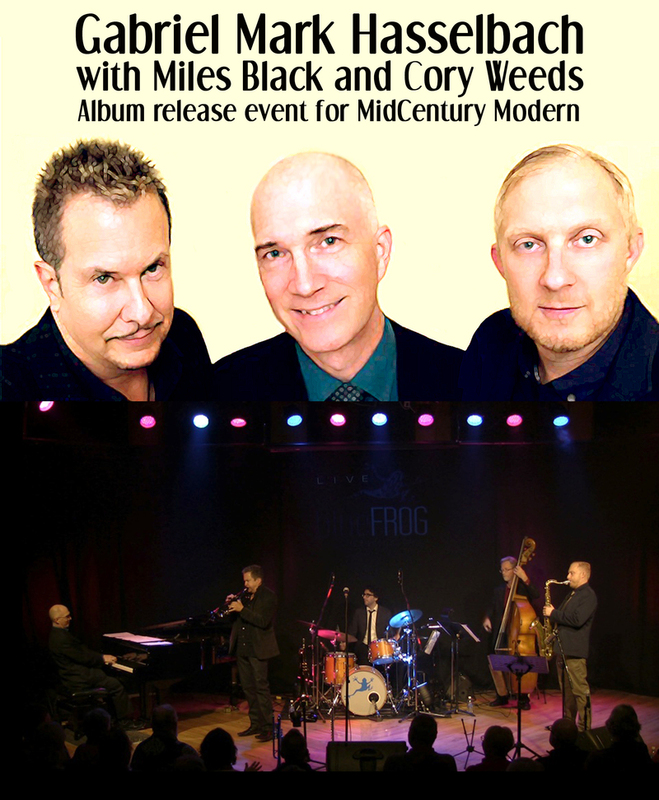 The third tune, “Blues on My Mind,” features Cory Weeds on tenor saxophone. He swings hard, along with pianist Miles Black. This tune moves from a moderate blues into a straight-ahead double-time tempo. There’s a horn refrain that harmonically pulls the piece together, as a comfortable reference point throughout. “Terra Firma Irma” is another one of my favorite compositions on this album and it features the great Ernie Watts on tenor saxophone. 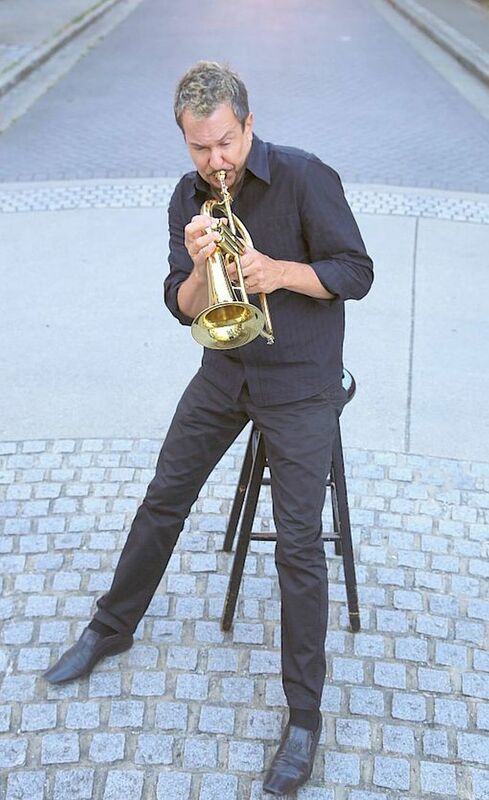 However, it’s the fiery Gabriel Mark Hasselbach, on trumpet, (sometimes flute), that brings this project to a boil. He keeps the music alive and swinging throughout. Hasselbach always manages to insert bold funk and lovely melodies into productions that make you want to dance, sing and swing. Available at all digital distributors, and physical at CD Baby and WindtunnelRecords.com. Hastings Casino Launch Party TONITE! 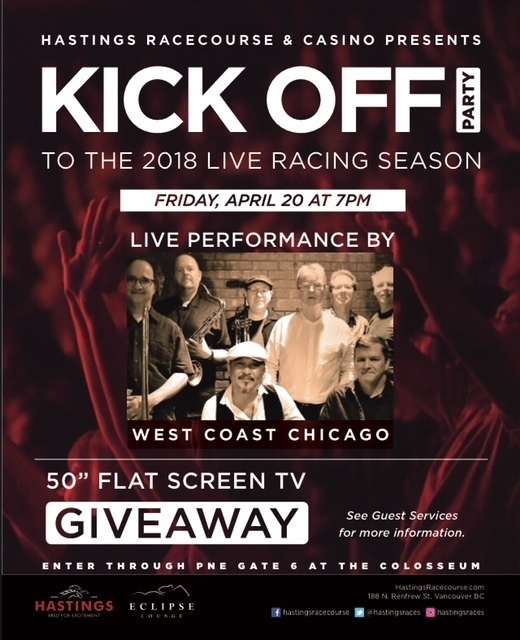 TONITE Hastings Racecourse & Casino launches racing season with a blowout party featuring the 8 pc band West Coast Chicago (a Chicago tribute band)! Win a 50” TV! Lots of food and drink! Free parking! No cover! Enter at Gate 6 by the Coliseum. Come hang with me and Sylvia! Save the date: Mensa event April 14! Occasionally I am asked to perform at an event for a really worthwhile cause, and April 14 is no exception! An evening of music, deluxe wine, and a sumptuous menu is planned for April 14 at the Pinnacle at the Pier Hotel (one of my favourite venues), details below. After expenses, funds go to the Mensa Scholarship Program which is open to full time students 18 and over - of any background - attending a Canadian post secondary institution. Parents take note, scholarships are being offered at the Mensa website. We warmly invite you to a special evening of food, wine, and live jazz. Join your fellow Mensa members and your guests to eat, socialize, and maybe even a little dancing. The notion is to enjoy ourselves while raising money for the Mensa Scholarship program. 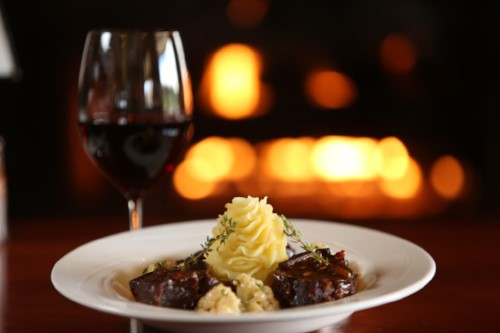 Attendees will indulge in a great meal with each course paired with an appropriate fine wine. The restaurant has an excellent reputation. The menu is listed below. 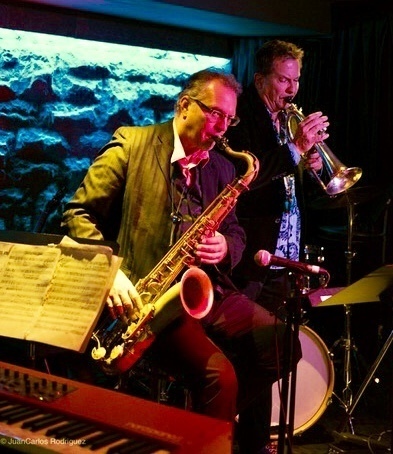 The very popular jazz musician Gabriel Mark Hasselbach will be performing for the evening. 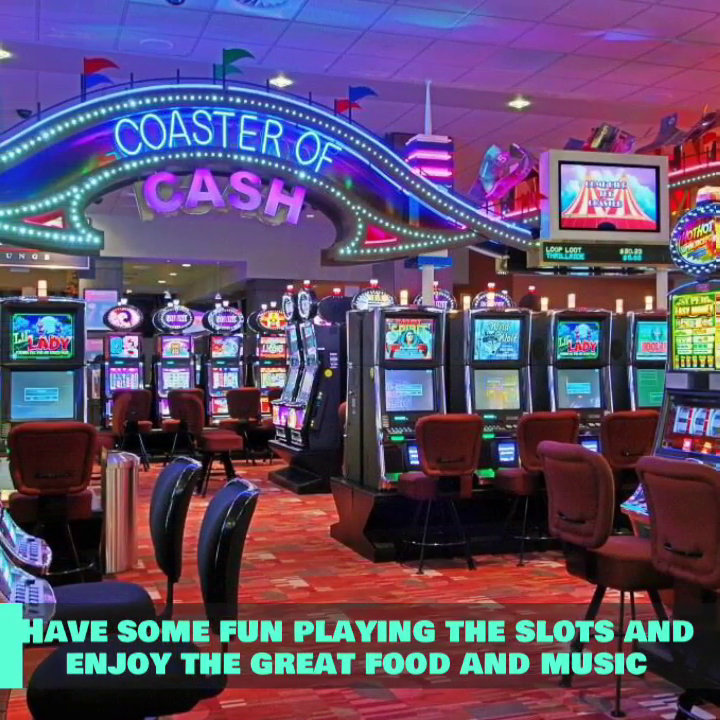 He is a regular performer at the Pinnacle, and well regarded. The event fee is $80 with a portion thereof going to the Mensa Scholarship program. Mensa members are encouraged to bring friends and relatives. Gabriel Mark Hasselbach (trumpet /leader); Dave Say (tenor sax soloist); Bob McDonald (tenor sax); Jim Pinchin and Ingrid Stitt (alto sax); Rod Murray and Greg Farrugia (trombone), Ross Gregory, Derry Byrne, Alex Kundakcioglu (trumpet); Dave Neal (guitar); Lorne Kellett (piano); Phil Robertson (drums); Torben Oxbol (bass). Vancouver’s newest East Side hotspot! Eclipse Lounge at Hastings Racecourse Casino. The music starts at 7 pm tonite with LesIsMore and Saturday with Acoustic Groove! No cover, $12 buffet, free parking. Enter by the Coliseum on Renfrew. 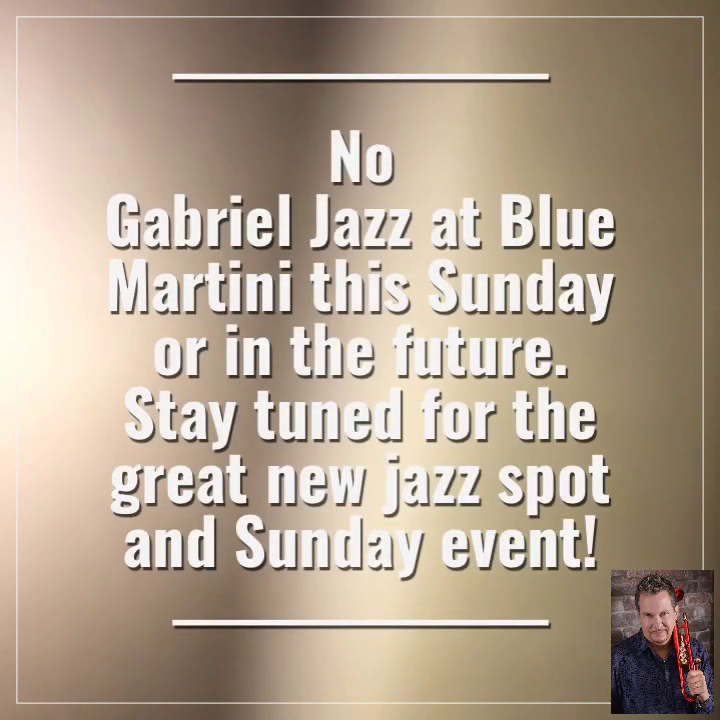 Gabriel’s Sunday Jazz Jam event closes shop at Blue Martini, so no jazz there tonite or in the future. Stay tuned for the new venue announcement, with great food and easy and free parking! Hope you can make it! New release cd included in ticket price! Experience the behemoth 18 pc juggernaut! Record the Oscars and hit the town for real on Sunday! Gabriel and his band is at the Blue Martini @ 7 pm, 1516 Yew St @ Cornwall.